It may not be a pot of gold at the end of this rainbow but our endless thanks and appreciation for playing along with us at The Paper Players this week! Before we get to my choice for Headliner, let's see what caught the eye of the Design Team this week. 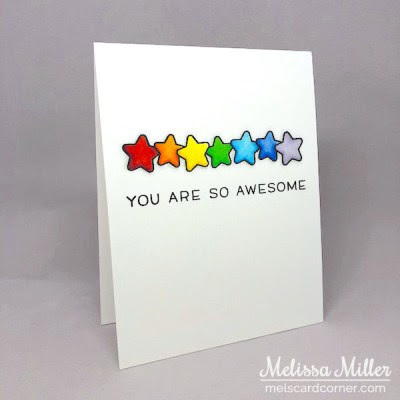 Melissa's sweet rainbow of stars stole my heart this week! I am amazed at the depth she achieved through the coloring and shading of this sweet little stars. Perfectly balanced between images and sentiment, this card is a Clean-and-Simple masterpiece. Congratulations Melissa, you're my Headliner this week! Thank you again to everyone for playing along with us. Congratulations to all our winners, please pick up your badges here. Come back tomorrow for an awesome Sketch Challenge from Claire! Thank you so much Claire! 🎉🎉🎉 Congrats to Melissa and the other picks. Fun challenge. Thank you Jan for picking my card. I really enjoyed this colourful challenge and with so many beautiful cards entered, they are all winners in my eyes. Thanks so much for the honor of being selected Headliner for this challenge, Claire! Congratulations to all the winners!! I'm so happy Annie picked my card! It was a fun challenge and I love all these beautiful cards!